After a long back/forth the insurance and the body shop, my 2014 Mazda3 sGT hatchback is being written off. Now is time to go car shopping. Don't really want to spend much time on research this time around as we have been out a car for awhile already. 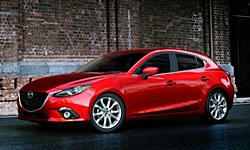 Gut reaction is just to replace with the same 2014-2016 Mazda3 hatch. We up to get the technology package and get the Smart braking as that probably would have avoided the demise of our previous Mazda3. Before I jump back on the same bandwagon, what are other alternatives I should today? Previously looked at GTI (owned VW before), and mildily considered the Focus ST. Now Civic hatch has returned, but does Mazda3 still reign supreme? Love everything about the Mazda3, expect the seats were a bit hard for long rides (2hrs+) and road noise (which can be solved by swapping out the OEM tires). We went through the same process and also ended up with a 2015 3. The Focus was expensive, felt cheap inside, and that auto trans needs to go to school - lots of weird jolts and actions. VW's drive nicely but anecdotal experiences of family and friends suggest that out of warranty costs will be high, and we tend to keep a car for at least ten years. Civic was a close second but the Mazda offers at the time were irresistible. We have had NO trouble with the car. It's my wife's car and she loves the thing. I am not such a big fan as I find it hard to see out of. Big A pillars, tiny rear window, high belt line. Our 2012 Forester feels panoramic by comparison. But...its more a function of current car design that seems hell bent on minimizing window area. But it drives well. Agree on the tires making a difference! We are loving our 2017 Mazda 3 Hatch. It has a stick so it's great to drive. The only other car I was seriously considering would have been a used Audi A3, but we had a lease we were allowed to trade in early and 0% financing so we just went with it. I am not going to drive an A3 for fear that I might have liked it better, but if you're in the market, I would try one out for sure. I have a 2014 Mazda3 sedan, and it is the funnest car I have ever had. I have been eyeing up the new Honda Civic Hatch. I would recommend at least checking it out. Apple Carplay and Android Auto are definate pluses for the Honda, especially since I fight with the Mazda's Pandora integration on a daily basis. It would at least worth a test drive. I looked at the Ford Focus with the turbo-charged engine and the Recaro bucket seats before I bought my Mazda 3 S-Touring. The back seats of the Focus are suitable only for children or midgets. There was less room in the hatch area and the reliability ratings on Consumer Reports (which I read with some skepticism) were quite bad. I also looked at the 2015 VW Jetta sedan, but the price was higher and the dealer didn't want to budge very much. I became concerned about problems with carbon-build up on the intake valves. The service writer assurred my that is not much of problem with the newer VW 4 cyl turbo engines. However, the "Humble Mechanic" guy on You Tube says that the newer engines have worse carbon build-up than the older ones. The cost of non-warranty repairs put me off. I didn't look at the Civic. I'm not fond of their interiors. I test drove a Honda Accord Sport and it had nice steering (not as good as the Mazda 3) and a very nice manual transmission (a little better than the Mazda 3). However, it was basically a stripped down version with few options. If I had to do it over again, I'd get another Mazda 3 S-Touring. The torque vector feature on the 2017 model's steering may make it even more maneuverable. My only gripe is the mediocre Dunlap OEM all season tires it came with. I can't wait till they wear out so I can put some Michelin Pilot Sport tires on it for the summer.